In western Christian churches, the day before Lent starts is Shrove Tuesday. 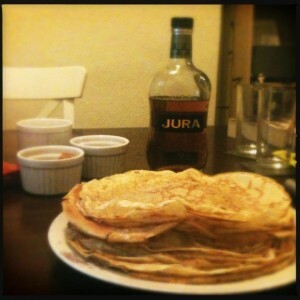 This is also known as Pancake Day. This day was traditionally the last chance to use up the foods Christians would not be eating during Lent. Today people often give up chocolate or alcohol. Festivities take place in many cities all over the world, including Mardi Gras in New Orleans (USA), Carnival in Rio de Janeiro (Brazil) and Venice (Italy). People dress up, wear masks, parade and dance in the streets. My dad was an incredible chef and storyteller. Between him and my mum, they had this handwritten recipe book in the shape of a red hardback notebook and into this recipe book they would note down recipes, observations, what worked/what didn’t work and their thoughts on recipes. Much to my sadness, I have no idea what happened to this amazing recipe book. But I knew, from this recipe book, all kinds of magical things would come: home made chutneys and other preserves, my dad’s famous curry, my mum’s incredible fruit wedding cakes, my dad’s even more famous recipe for pancakes. If there is ONE thing I regret about this red book having gone awol, it would be the loss of this recipe. I’ve kinda made it my life task now to find a recipe that would be on par with his. So far I’ve tried several and one that’s being the best thus far, because it’s so forgiving and you can mess around with quantities. Easy as pie recipe this – I tend to double it up and make thin crepes and Mark and I eat ourselves to a standstill. In a small bowl beat the egg and milk then add the melted butter. Pour the mixture into the flour, stirring all the time. Then whisk it up until you have bubbles in your mixture – you can let it stand for a bit / use it immediately. Heat the pancake / frying pan, sprits spray/ butter and then add a ladle of batter, swirl across pan and cook pancake until the edges brown and flip to cook the other side. I strongly believe though that the trick to making decent pancakes is: 1. a decent pan and 2. a stainless steel mixing bowl. The bowl thing is maybe just my bit of superstition, but it works for my pancake batter every time, as well as my batter for making yorkshire puddings/toad in the hole.